Cool! Was thinking of buying one of these machines......... especially if you do get the audio/resolution etc sorted out. One question though... is there room in the machine to add an internal hard drive rather than use the SD card? Thanks for letting us know that eComStation works with the eeePC. I asked that very question on the eComStation Beta Newsgroup not too long ago and never found the answer. I will be following your progress. meanwhile the sound issue is fixed. 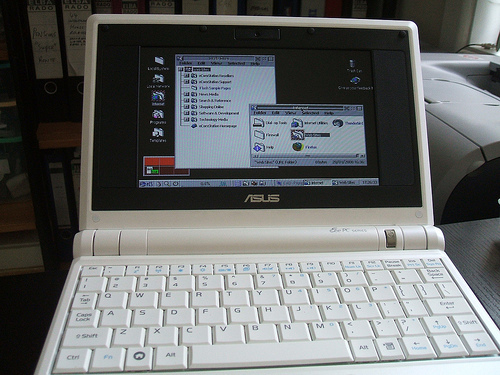 I also made some (poor quality, poor english) videos of this, please search youtube for ASUS EEE and OS/2. Yes, thank to help from the worldwide OS/2 and eCS community, the EeePC can run eComStation 2.0 RC4 either - from it's internal Solidstate disk if you wish to use eCs as the main OS or if you want to keep the custom Xandros on the system, it even boots from an SD card in the built in reader or from a USB memory stick connected to any of the three USB ports. To see this Sigurd, has created some videos and put them on YouTube - search on eCS and eComStation. We are still having issues with the network chipsets however we are hoping to get more help from the community here - in this case in the form of the GENMAC team. just published a new german AND ENGLISH Howto on hobbes. It is the 1.1 Release. It's taken a little while to figure out but I now have the on-board network connection WORKING !! Thanks to Doug Bisset who put me on the correct track to how to get GenMAC 2.20 to install with interfaces that it does not support. I am now trying to sort out the WLAN as well, using the same approach. Once I have all sorted I will document this in version 3.0 of my write up on Hobbes (this will be in English and German versions). THIS RESPONSE IS BEING TYPED FROM THE ASUS EeePC RUNNING eCS 2.0RC4 from it's SD Card over the on-baord LAN connection !! you are simply the best!!!!! Besides: this facts about the 701 can be used for the upcoming Modell 900 of the EEE as well. As far as I know there is only more RAM, bigger Display and bigger SDD to come. Actually the LAN and WLAN drivers are working, if you choose to install on internal SSD. Unfortunately I ca not read the two states written in Russian, so I don't not what they want to tell. Ed uses SD card installation, I am using SSD internal drive installation. LAN is working OK, WLAN (with a hacked GENMAC driver) is working but a little weak. It need to reinitiate the WLAN driver from time to time but for reading mails or surfing the net it is quite usefull. The problem still is, that I get no reply from the GENMAC group wether it is OK to distribute the hacked files or not. you can watch this picture - I used the Firefoy three via WLAN with the EEE. What do you mean with 800X480? As can be read at the installation Howots at hobbes, 800 X 480 is working with panorama and widescreen activator. But still a BIG problem: one cannot use the external VGA to show presentations on external monitors! This is something I really miss! I installed RC6 on my 701 surf. The GENMAC driver is still waek. I need to reinitiaite it within one minute. Do you know any progress made with te GENMAC? yes, there is a solution for this. Ed Durrant made a new package and loaded it up to Hobbes, please download it as there are new instructions included as well. I sent them to you by mail.